Mooresville, NC 12/4/14 – Wildcat enthusiasts have something new to be excited about. JRi Shocks has released a new upgrade kit for 2015 Wildcat and Wildcat Sport models featuring JRi’s ECX 1 single adjustable shocks. This new upgrade kit converts the factory installed single adjustable shocks to a more versatile three-way adjustable shock package. The upgraded ECX 3 features adjustment for high and low speed compression as well as rebound. Customers can send their existing ECX-1 shocks back to JRi for the upgrade installation and have their single adjustable shocks converted to three-way adjustable for a fraction of the cost of a set of new three-way adjustable shocks. The upgrade kit features a new crossover and two speed compression adjuster while retaining the same shock body and factory installed spring. For owners of pre 2015 Wildcat models, JRi is offering a discounted price on its three-way adjustable shock package. 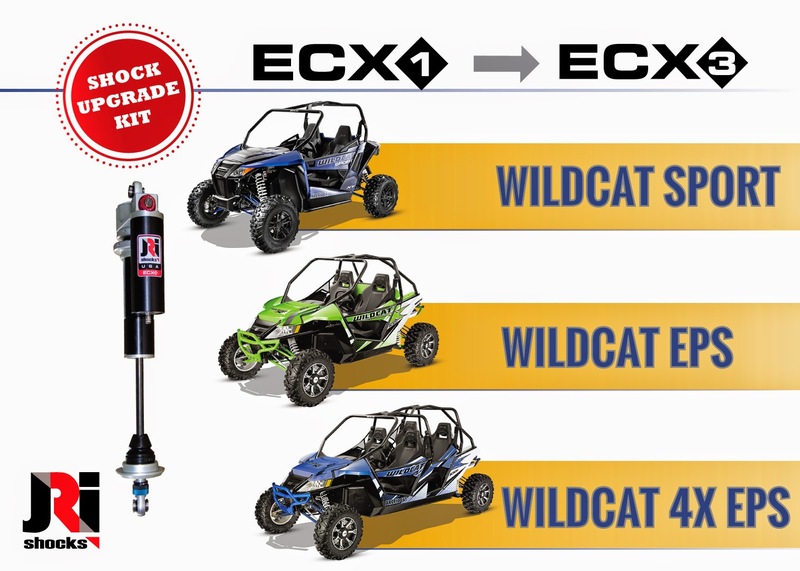 Owners of Wildcat 1000 model years 2012 – 2014 and even 2015 Limited Edition and Sport Limited owners can now purchase a complete JRi ECX 3, three-way adjustable package. JRi ECX 3 Wildcat 1000 shocks feature 2.0” bodies with 2.5” piggyback reservoirs and 5/8” shafts on the front and 2.5” bodies with 2.5” reservoirs and 7/8” shafts on the rear. The Sport Limited system features 2.0” bodies with 2.5” piggyback reservoirs and 5/8” shafts all the way around.